Women have always had a lot to fret about. In the olden days it was all consternation over how to keep whites white when the stream was muddy, how to prove they weren’t a witch before loonies killed them, or how to fend off amorous Vikings flushed from a successful day’s pillaging. Now we have a lot more to worry about. Like body hair. What a rigmarole for the modern gal. One day you’re 13, listening to Take That, and getting your mum to confirm that everything’s normal ‘down there’ and developing just like in those You And Your Body books. The next you’re 29, listening to Take That, up to your navel in Boots own hair removal cream and wondering why the instructions never said anything about The Almighty Screaming. In between those two points of course are a thousand misdemeanours along the road to finding what’s right for you. A thousand mis-plucked eyebrows, deodorant burns in armpit nicks, near-death Gillette leg gougings, and various other unmentionable endeavours in the name of being smooth as a scaffolding pipe. Most women usually fall somewhere amid the following: making sure that their eyebrows don’t startle small children in the street, their armpits don’t give refuge to small nocturnal animals, their leg hair doesn’t get caught in escalators, and their nethers don’t inspire lusty woodcutters to come at them with tools. It’s a pubic pallavah of varying proportions until you finally decide, definitively, what you can and can’t be bothered with. Some women brightly declare that they don’t care anymore – that they feel comfortable enough in themselves and in the love their partner has for them to just…let it be. Maybe they are suddenly bathed in the glow of revelation while reaching for a blunt soap-caked Venus or a rusty pair of tweezers. Maybe they let their bodies do their thing. Maybe they even grow to love what their bodies do and grow and look like. I was inspired to write this column by a lady I saw this week. She was buying a big book about make-up techniques along with a little book about the style of Princess Kate. She had long, slender fingers, a pristine purple coat, and tottered on beige heels two sizes too big. Her legs put mine to shame and she was at least in her 70s. She had a stubborn girlish air that railed against time. She was probably very pretty once. 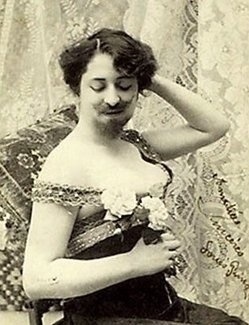 But her chin was covered in long silver hairs in what I suppose can only be termed ‘a near-full beard’. I was shocked to see it given her careful attire. I collected myself, and pushed my thoughts to one side. My thoughts being: how could a woman be interested in ‘beauty’ yet not tend to basic facial pruning; why on earth didn’t she sort that out? Ugly thoughts born out of my own shallow prejudices. Only later did I think, why the hell should she? Why should she feel uncomfortable with her body’s natural course? Why should she waste her twilight years being pointlessly insecure? Why can’t she enjoy make-up and glamorous coats and royal style while sporting a dishevelled goatee? She may have had the faraway stare of someone who wasn’t really there anymore, she may have had a permanent benign smile of someone who’s slightly mental and just on the dotty edges of everyone else’s ‘sane’, nicely coiffed world, but she looked happy and totally unaware of what was aesthetically expected of her by a society that’s too often told how to look and what to worry about, and I realised I envied her. Her, and her warm little freedom beard.